Last month, the Government Accountability Office (GAO), the federal legislative branch’s research arm, published a follow-up report to the July 2018 report on supplier number decreases. The December report, titled, “Medicare Fee-For-Service: Information on the Second Year of Nationwide Reduced Payment Rates for Durable Medical Equipment” shows that the number of DME suppliers continued to decrease in 2017. Suppliers furnishing rate-adjusted equipment in non-bid areas decreased by 11%, while beneficiary utilization decreased by 2% compared to 2016. 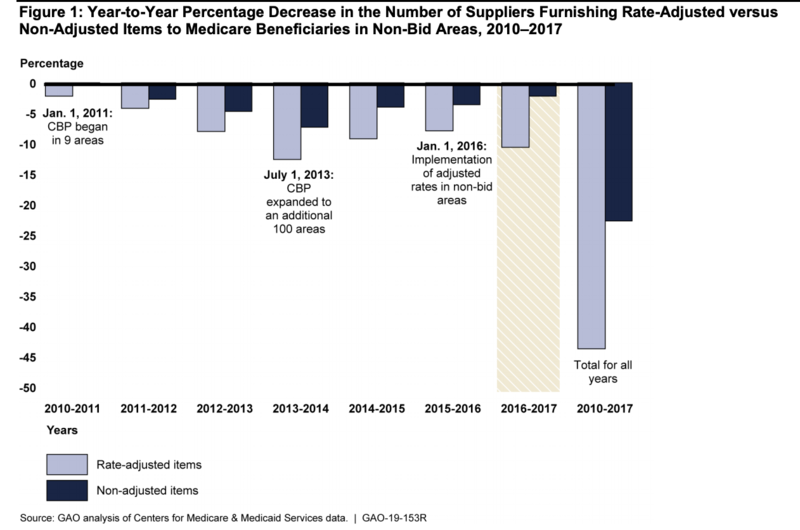 The GAO found that since 2010, the number of suppliers furnishing rate-adjusted items decreased by almost 45% and suppliers furnishing non-adjusted items decreased by almost 25%. The GAO’s findings align with AAHomecare’s supplier analysis, which shows an estimated decrease of 35% in the number of supplier companies between 2010-2018.